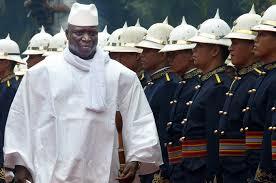 ECOWAS troops have been ordered to capture Gambia’s President Yahya Jammeh alive or dead. An ECOMOG military Commander, Maiga Mboro said “all the troops are already in place” and some not far from the Gambian border. Already 11 pilots, 11 crew members and 80 “supporting troops” have been deployed close to the Gambian border.